King's Highway 103 was a major arterial highway which once connected Highway 400 & Highway 12 near Coldwater to Highway 69 near MacTier. The highway existed up until 1976, when it was officially renumbered as Highway 69. The history of Highway 103 dated back to the mid-1940s, when the Department of Highways of Ontario (DHO) assumed the Waubaushene-Port Severn Road as a new King's Highway. A Preliminary Route Plan was prepared dated June 26, 1944, showing the proposed route of the new provincial highway in Simcoe County. The entire route was assumed by the province on July 19, 1944. The Waubaushene-Port Severn Road mysteriously shows up in mid-1940s DHO mileage logs as a portion of Highway 12. However, it is believed that the highway in fact did not have a posted route number upon assumption. The use of the King's Highway 103 designation seems to have commenced in 1947. Highway 103 began very humbly as a tiny connector road between Highway 12 at Waubaushene and Port Severn. The highway was originally 10 km (6.5 miles) in length. However, this tiny road had a very important future ahead of it. As early as 1949, surveyors were at work laying out potential routes for the Trans-Canada Highway. One of the proposed Trans-Canada Highway routes passed through Central Ontario from Ottawa along Highway 7 and Highway 12 and then headed north along Highway 69 to meet up with the main western leg of the Trans-Canada Highway (Highway 17) in Sudbury. It was suggested that the Trans-Canada Highway should be constructed on a new alignment through the District of Muskoka. Only a single two-lane highway (Highway 11 & Highway 69) connected Southern Ontario with the District of Muskoka at that time. It was felt that adding Trans-Canada Highway traffic to a route already overburdened with cottage country traffic would only make traffic congestion worse. Furthermore, constructing the Trans-Canada Highway closer to the Georgian Bay shoreline would drastically reduce the highway distance between major towns such as Midland and Parry Sound. It was decided that Highway 103 would be extended north from Port Severn to meet up with Highway 69 at Foote's Bay, near MacTier. Work began on a northerly extension of Highway 103 in 1955. As part of this work, Highway 103 was mostly rebuilt on a new diversion which bypassed Waubaushene and Port Severn entirely on a series of bridges and causeways across the Severn River and Matchedash Bay. The extension of Highway 103 from Port Severn to Foot's Bay was completed and opened to traffic in December, 1958. The new extension was already paved at the time of the highway's opening. The diversion around Port Severn and Waubaushene was not quite complete, and so that section was not opened until the following spring. In the meantime, traffic could still utilize the original route of Highway 103 passing through Port Severn in order to access the new highway to MacTier. The majority of the original 1944 route of Highway 103 had been bypassed by the diversion. Accordingly, jurisdiction over the old route of Highway 103 was transferred from the DHO to the Township of Tay, effective January 29, 1959. During 1965, a concurrent designation of Highway 12 & Highway 103 was introduced. The two highways overlapped for approximately 8 km (5 miles) between the Highway 400 Junction near Coldwater and Waubaushene. This was done presumably to guide travelers from the north end of Highway 400 at Coldwater onto the rather confusing Trans-Canada Highway route leading to Parry Sound and Sudbury. Motorists arriving in Coldwater on Highway 400 had to turn left onto Highway 12 West, then turn right onto Highway 103 North and then follow Highway 69 North in order to reach Parry Sound and Sudbury. The overlapped route between Coldwater and Waubaushene meant that motorists only had to remember to follow Highway 103 once they reached Coldwater. The overlapped route of Highway 12 & Highway 103 is shown on the Official Ontario Road Maps from 1965 up until 1968. However, highway mileage logs produced by the DHO and their successor, the Ministry of Transportation and Communications (MTC), continued to show the overlapped route of Highway 12 & Highway 103 right up until 1976. Highway 103 was 58 km (36 miles) in length, as a result of the overlapped routing. Ultimately, the route numbering logic in this area was corrected in the mid-1970s, when a major route renumbering took place. To better reflect the predominant traffic patterns, Highway 103 was logically renumbered as Highway 69 between Coldwater and Foote's Bay. In turn, the original route of Highway 69 from Foote's Bay to Brechin, via Gravenhurst and Washago, was renumbered as Highway 169. 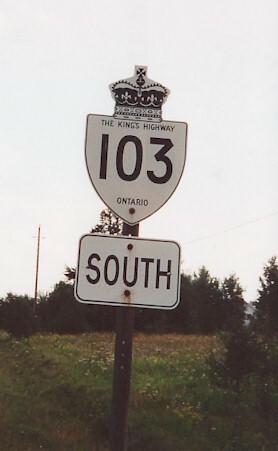 The Highway 103 designation was permanently retired from the King's Highway System, as a result of the 1976 highway numbering change. Coincidentally, most sections of Highway 69 that supplanted the old Highway 103 designation were later renumbered as Highway 400 as the four-laning of Highway 69 was advanced north from Port Severn during the 1990s and 2000s. An interesting error took place during the construction of Highway 103 in 1956. The original planned site for the Moon River Bridge was actually several hundred metres east of the present-day highway bridge. An alignment for the highway was cleared, and rock cuts were blasted through several small hills along the route. DHO engineers were surprised to learn after this initial work took place that there was inadequate bedrock at the proposed bridge site to safely support the foundations for the proposed Highway 103 structure. The entire alignment on the north and south banks of the Moon River had to be abandoned, and a new bridge was constructed further downstream. The old alignment is still somewhat visible from the current highway, but it is rather overgrown. However, disused concrete culverts under the abandoned highway can still be seen from at least one point along the realigned highway. The old rock cuts are still quite obvious along the path that was at one time the alignment cleared for the new highway. Blasted rock from the rock cuts can be seen along the banks of the Moon River, where the ill-fated original bridge was supposed to be constructed.